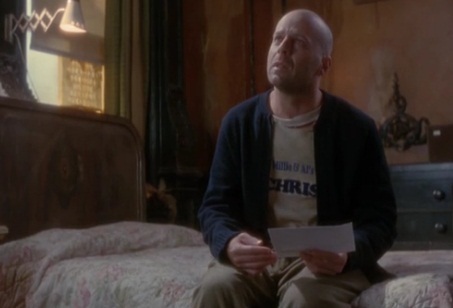 In some scenes of 12 Monkeys Cole (Bruce Willis) wears a t-shirt with the word "Chris" very visible. This is an homage to Chris Marker, the french film director of "La jetée" in which the movie is based. Are there any other subtle references to "La jetée" in the movie? You should probably be knowing that the movie itself is inspired from La jetée. Not the answer you're looking for? Browse other questions tagged 12-monkeys la-jetee reference . Why did director Chris Marker use photographs in La jetée? In “La jetée” does the time-traveler's body stay in the present time? Were the direct references to Die Hard and Under Siege made on purpose? How is The Godfather: Part III related to the Cavalleria Rusticana? Is the orange coat guy getting killed a reference to South Park's Kenny? Are there any other films which are constructed in a “Photomontage with narration” style similarly to La Jetée?